Okay, first order of business, the hash-brown trial was a bust. A delicious bust, but it took way too much effort to prepare, to cook and just to generally achieve a mediocre result. Man, that squash tastes wonderful even when it’s just tossed with and egg and fried until the end of days. Still didn’t crisp up much sadly, curious reader, but as a recipe I couldn’t post it in good conscience. A quick run through for the ever incurably-curious: *Takes a breath* Well: Peel it, grate it, wash it three times, drain it, press it dry, pat it dry, add a medium egg, salt, pepper, stir it up, heat butter and olive oil in a pan, full heat, add a dessert spoon and flatten it out, cook until solid on one side, flip, press with a spatula for fifteen minutes or until browned. Alternately stir it around like a scrambled egg. Again, alternatively: Go with this recipe, it’s far better. I’m talking sell your great-grandmother’s jewels better, heck, you’ll sell your great-grandmother for this recipe. I’m the world’s worst recipe blogger at times, I admit, too honest in some regards, far too flippant, but, hey, this is cooking and baking by a real person. There’s rarely anything here you couldn’t try your hand at. I don’t want to be the cause of someone feeling they can’t match up by pretending or affecting. If I can do this, you can do it too and probably better. Gardeners alone that toil in yonder garden, Enjoy such crunchiness. Sorry Lovelace. Oh, the potato-peelers, the tuber-eaters, the nightshade-nibbles, HOW I DESPISE THEM SO…Wait, nah, I’m nightshade intolerant, but I’m fairly chill about it. It’s a damning intolerance to match with coeliac disease, no potatoes, no chillies, no peppers, and so on. I’ve had it my whole life and you learn to accept it, by which I mean you spend most of you life miserable and undiagnosed. Bitter, moi?, yeah, probably. I never looked back when I gave up nightshades, but I do miss the odd potato. You’ve heard me rhapsodise on the remarkable texture of the harlequin squash, never festival, never, and you might ask why Faux Roast Potatoes? Because this isn’t your everyday-run-of-the-mill-roast-it for-two-hours-and-it’s-chewy squash, no, this is a roast potato in everything but it’s origin. It was not dug from the ground, it grew, like all good berries, on a vine. But when stripped of that outer layer, cubed and roasted in oil it becomes a potato. The outer layer is crispy, not unlike a chip, or French fry if you’d rather, the inner, why it’s almost too good to attempt to describe. I may die in the attempt, just remember poor me fondly, sentential reader, and when your grandchildren gather round tell them of Jack, he who would describe this beautific squash. Here I go, a far greater thing etc: It’s bloody lovely innit. All soft and buttery like. This is a nightshade free dream. Absurdly simple to prepare, I’ll omit the growing of the squash. Worth the effort. Where sautéed harlequin has a flaky crispy outside, this has a solid crunch, with a fluffy interior that beggars description. I might just cry when I consume my last squash. Remember also that it can be steamed and mashed and substituted for mashed potato. Now, that’s it for me until the next harvest. I have pots to plan the placement of and a lot of thumb twiddling to do. Until we meet again. 1. Preheat the oven to 200c (fan). 2. Add Harlequin Squash, Coconut Oil, Salt and Pepper to a bowl and toss to combine. Add everything to an oven proof dish, or line a tray with greaseproof paper, and bake for 20-30 minutes until brown and crispy. Serve immediately. The flat version of the harlequin-hash-brown. The scrambled version. Still tasty, just too soft. Roast ’em, blend ’em and repeat forever. Just a quickie and a garden post that’ll follow below the recipe. I know, but the garden is flourishing with this wet and warm weather. Let Jack have his fun, dearest reader. You’ve seen this recipe a few times with my various nut butters. I keep them separate as they may get tweaks in the future. I used my Peanut Butter Cookies recipe for the cookies. They were rather messy to work with, that’s why I prefer using all natural peanut butter. A much better dough. Still with wet hands you can form rough rounds and they bake fine, just give them an extra five. I gave them a sprinkle of sugar, but that’s optional. I think of these as uglies. They taste the same. They taste okay, I wasn’t that wild on the Brazil nuts to be honest. It’s just nice to have options and making your own butters is really cheap. Well, it can be if you can get the nuts cheap. That’s not always a given. You get the chance to experiment with new foods on a limited diet then you take it. They do go well with coffee, but very little doesn’t. I haven’t much to add to this post. Still a recipe’s a recipe and that’s something, right? Sure it is. A bit on the garden below, just after the recipe. See you again soon. 2. Spread the Brazil Nuts out and then bake for 10-15 minutes, stirring to prevent burning as needed, until fragrant and slightly browned. Be careful of burning. 3. Add the Brazil Nuts to a food processor, while still warm, and blend until a smooth glossy paste has been formed. Add Oil as needed to facilitate blending and stop every few minutes to prevent food processor over-heating. Store it in the fridge. 2. Combine Eggs, Vanilla Extract and Sugar in a jug and mix well. 3. 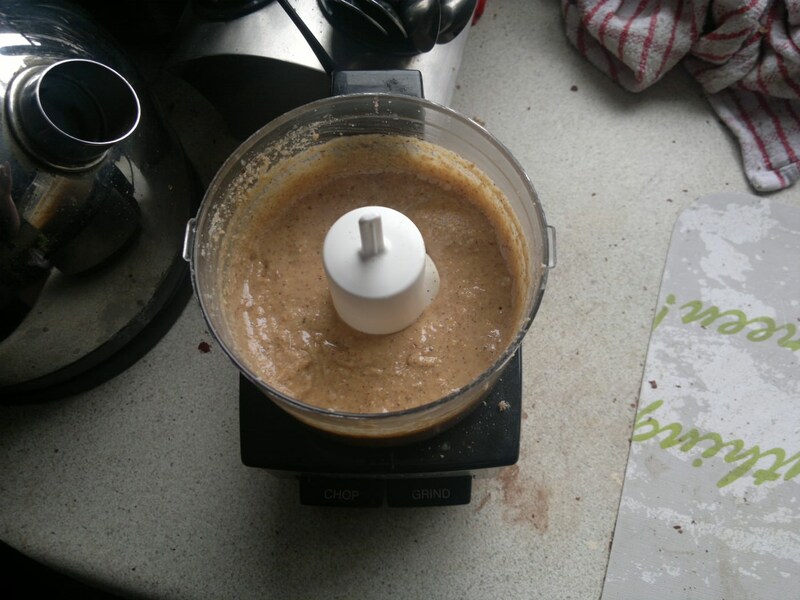 Put Brazil Nut Butter into bowl, add wet ingredients and Baking Soda and mix, with an electric mixer, until a thick sticky dough has been formed. 4. Using wet hands form into 1 Tbsp sized balls and flatten onto Greaseproof Paper and bake for 15 minutes. Then remove from Oven and rest on tray for a further 10 minutes. Then let cool completely on a wire-rack. My sunflower is doing a thing. That’s the technical term. It’s forming what looks like miniature heads at the sides. This might actually be bad, but I think it’s cool. Flowers are really time consuming, they take so long, but I think I enjoy them. My hanging basket idea went to…*Covers your ears*…heck, heh, got ya. I wanted four colours evenly sectioned. Eh, I made mistakes, it went wrong, but I now have a plethora of lobelia because I separated what grew. I ended up with three colours: White, Blue and Purple. The pink is in a pot slowly growing. It turns out they need shade, perfect for the baskets out front. I’ll have photos when they really start to bloom. They’re all over the place. They’re perennials so they should be back next year too all going well. So it all worked out in the end. The nasturtiums I planted look a lot redder than I imagined. They look rather nice, I wasn’t sure if they’d be at all attractive. My Giant Swiss Pansies have flowered, well one has. I grew these from seed and they seemed to do nothing for so long. They do look well, hopefully in another month they look more impressive. It’s an accomplishment, albeit it a small one. I left the basil to grow wild and it doing really well, it shouldn’t be doing so well, it should be too cramped. Luck: It’s always a factor. More pesto for me. Really red, right? I can’t wait until they open. So small, but they’re flowering. I shall call you Mini Jack. I shall call you: Fluke. “Is that a camera! ?” Nah Naru, it’s nothing, Said Jack, taking a photo from one end of the garden or else Naru would run away. You knew this was coming. Because I told you a lot. I was in the garden for a lot of today, but I knew I had to make this so here we are. this wasn’t as labour intensive as I remember, mind you I didn’t use added oil, or at least not enough, way back then. We all learn and grow and make butters…that got away from me slightly. Not much to say, I’ll try to teach you any little tricks I’ve been using and hopefully someone out there will want to make almond butter too. This might be something I’ll do fairly often as it’s about 1/7 of the cost of store bought. In saying that it depends on the availability and price of gluten free almonds. 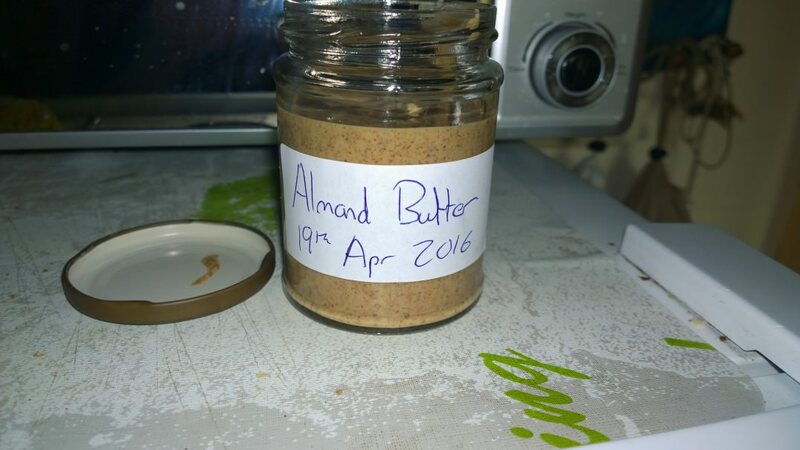 I’d say give it a month in the fridge to be safe, check it occasionally but do be weary of it going rancid and yes in the fridge or you’ll regret it and have wasted this delicious nut butter. The nuts don’t darken a lot, if they do they’re possibly burned. This is another of those where you go by smell and taste, you’ll want to avoid over baking them or you’ll end up with a nasty tasting butter, but at the same time you want them nicely toasted (Yes, I know I said baked a moment ago, I’m not perfect nit-picky reader, I just seem that way). You might be able to peel them by rolling them on a tea-towel, but why waste the skin? I didn’t bother with salt or any other flavourings as I use this in curries and breads and I like it as plain as possible. First it goes chunky and slightly thin, you could stop here, but don’t. One tip: Measure out how much your food processor can take before roasting (Yeah, I’m just messing with you now) as you won’t want to overfill it and leaving some to rest will let them cool and it’ll be harder to grind them into butter. My little food-processor took 200g so you can probably get a lot in a larger model. You might be best to just grind what you’d need for a few weeks, maybe use some right away if you make too large a batch. Remember it can be used in place of peanut butter, so you could have delicious cookies, I won’t be doing a second recipe this time around as I just want the butter. That’s it for today. I’ll be tackling tahini next so keep an eye out for that. Take care. Later. Smooth and glossy is best. 2. Spread the Almonds out and then bake for 10-15 minutes, stirring to prevent burning as needed, until fragrant and slightly browned. Be careful of burning. 3. Add the Almonds to a food processor, while still warm, and blend until a smooth glossy paste has been formed. Add Oil as needed to facilitate blending and stop every few minutes to prevent food processor over-heating. Store it in the fridge. A cold is messing with my histamine intolerance so I’ll have to wait a short while before the flood of seed recipes start. They’ll probably be fine, but it’s always best to be certain before baking and cooking too much with them. Histamine intolerance is a pain because so much can affect you, but whether it will will depends entirely on you and external factors like stress or cold can mess with it too. Histamine intolerance is a pain in the backside basically. But I’m not here to moan, maybe I am, but I’ll refrain. 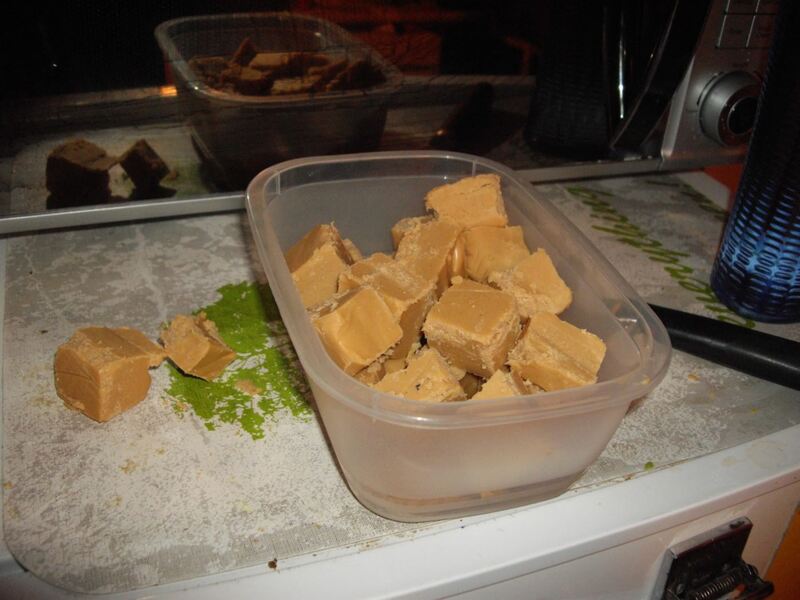 I bring you Freezer Fudge! Which is…everywhere really. The reason I haven’t attempted this before is the confusion with which peanut butter to use. The original (From The Merrythought) calls for smooth natural peanut butter and, well, you see I have a brand that’s nuts and skins and nothing else, I call that natural, with me so far my leguminous (That’s a word? I was just kidding. Wow.) reader? Then I have an unsweetened peanut butter with no skins, I think, with extra oil and sea salt added. Then of course you have the version with sugar similar to that, but I find that too sickly to eat nowadays, cut down on sugar and that happens. I use the Natural in cooking and baking and it’s incredible, the texture and taste are perfect, but in this I knew it’d be too dry and strong tasting, so I opted for the other, I think it was what the original called for based on the colour. See? This is why I was hesitant. Food terms can be bewildering. So can my explanations, heh. So, as I said I had salt in the peanut butter, but if you don’t add it and if you’d like it saltier then add more. I’ve used maple syrup because it’s amazing with peanut butter and the vegans, I keep using their recipes so I like to when possible repay them. I do make it sound like there’s an entire country with just vegans, that’s probably not true. Is it? I mean leguminous was a word. Digressing? Me? Why tactful reader you’re right! How very dare me, I swear….kidding. The fudge is really simple to make, I put the coconut oil in firs to stop the peanut butter sticking to the side, other than that it’s the same. It froze fast and tasted delicious, really creamy and, yes, fudgy. It’s probably healthy, but I don’t like adding that tag as it gives the impression that you can’t overindulge on it, broccoli sure, fudge? nah. It makes quite a bit, you could halve it, but for a change I didn’t. I deserve something: I’m itchy! Okay, this has been a quickie, but a really nice recipe. Until next time. Leguminous. Really, I just called my readers pea-like. I hope they’re not pea-d off. 1. Line a loaf tin, or any container, with cling-film or greaseproof paper. 2. Add Coconut Oil to a bowl and then add in everything else. Mix together with a fork until combined and glossy. Add more Salt or Maple Syrup to taste. 3. Pour mixture into prepare tin and place in the freezer for a few hours or until solid. Remove from the freezer, pop out of the container and remove the cling-film and cut into cubes. Transfer to a sealed container and return to the freezer. Eat directly from the freezer. Just one unrelated story before we start. I seem to keep doing this, don’t I gentle reader? Surely you’ll forgive me, right? I have cookies you know? Okay, all kidding aside, the little story I wanted to tell you is this: You know my now famous Hokkaido Pumpkin Bread, what?! Did you not see my name in a Japanese spam post on Twitter, I’m an international success! Or rather, you know the bread just one post down that perhaps no one else has tried? Well, two people have. My Mother tried it and enjoyed it so much she made her own using self-raising wheat flour and then made another batch, sugar free this time, for our diabetic neighbour. There wasn’t much difference in taste without the sugar, but the bread was softer without the buckwheat flour according to her. It also had a stronger orange hue. Always a lovely boost to the ego when someone tries an original recipe and likes it. Now one last thing, I was thinking of posting a squash preparation guide as I have a third pumpkin to carve up and thought, although not a difficult task, it may be useful for anyone inexperienced in squash prep. It’ll be a Hokkaido Pumpkin again, but I’ll give tips for all kinds of squash. If you’d like to see it just drop a comment below, I’ll probably do it regardless of interest, but if there’s something particular you’d like to know or have me include just say so and I’ll see what I can do. Yeah… same dough. Firm to roll, mush to work. That’s why they look lovely before I move them. Afterwards they look like an earthquake hit during a blackout. I skipped the filling on these and just went with the aforementioned mixture, but check out the original recipe as it sounds lovely. I also went half as there was plenty for me in just half. Now there are two major points I should mention, first the dough is fiddly, but if you take your time you should be able to get perfectly shaped cookies that present wonderfully. I wasn’t inclined to bother, they’d taste the same so I took the lazy route. Secondly I find myself again disliking honey in baked goods, I can’t say why, but I find it jarring, it’s not that it was too sweet, it’s just a personal thing. I do wonder how maple syrup would fair as I think I used it in a similar recipe before (Edit: Yup, here), it would affect the colour and possibly the baking so if you do use it do so with caution. Now there is one thing I have to draw your attention to: The Texture: It’s wonderful, somewhere between a soft cookie and a firm biscuit, it’s just amazing. Not much else to say, this is the second last recipe for quinoa flour I have sitting here and after that I’ll have 125g left, but I have no recipes to use it in yet. As they say: All good things come to those who Google. Sixteen or fifteen and one huge mound of a cookie. More delicate hands than mine would be needed to make these more attractive. That’s it for now. See you soon. 1. Pre-heat oven to 150c (Fan) and line a baking tray with greaseproof paper. 2. Add dry ingredients to a bowl, shake together and mix in Coconut Oil with a fork until fully incorporated. Then add the Honey, a little at a time, until a crumbly dough that holds together when pressed has been formed. Roll into a ball, dough will be firm and dry to the touch, wrap in cling-film and leave in the fridge for half and hour. 3. Roll out the dough between two sheets of greaseproof paper to about 1/4 inch thickness and cut out using a cookie cutter. Place each cookie on the prepared tray. 4. Bake for 10-12 minutes until a golden brown colour. Remove from the oven and let rest on the tray for 10 minutes, cookies will firm slightly as they cool. After 10 minutes move to a wire-rack to cool completely. Letting it chill will make it easier to handle. Sorry about the mess, BNS Pasta Sauce was getting ready for freezing. The dough is similar to my Coconut Flour Cookies, sticky at first, but after resting it’ll firm up fine and you can just pop it out of a measuring cup without any fuss or mess. I ditched the honey in favour of Maple Syrup as I find honey burns too easily for me and makes everything too dark. I also subbed BNS for pumpkin because I have no hope of finding a pumpkin here unless it’s Halloween and even then they’re not quite at a level of quality for eating. I actually had two BNS for this and thought I’d have too much, nope, I actually had to defrost some of my frozen squash and use that instead. I think they must’ve been thick skinned as I usually have enough in one. Now I should say that anything I say now is in no way a reflection of the original recipe’s quality or taste, this is just personal taste. Honestly, I just can’t get into coconut flour. I mostly used this recipe to use it up. It worked well and the muffin tops were tasty, but I just don’t like the texture of coconut flour. It may be a brand issue, but it’s happened twice already. Like I say taste-wise they’re really great, there’s a lot going on, but they weren’t too sweet nor was I overpowered by the pumpkin spice. I guess coconut flour and me just don’t mix. Still it’s a really great recipe, even with me tweaking it a lot and it would make a great frozen breakfast as it should freeze fine, just defrost it well before eating. Check out the original too and find which version suits you best. You could double or triple this if you wanted, I just happened to have three store-bought eggs that needed to be used up. Makes 6 Muffin Tops or 22 1 Tbsp Cookies. 1. Preheat oven to 175c (Fan) and line a tray with greaseproof paper. 2. Using an electric mixer beat together the Eggs, Butternut Squash Puree, Maple Syrup and Vanilla Extract until well combined. 3. Beat in Coconut Flour, Baking Soda, Pumpkin Spice until well combined. Finally beat in Coconut Oil until thoroughly blended in. Scrape dough into centre of the bowl and let chill in the fridge for 5 minutes. 4. Scoop 1/4 Cup’s worth of dough and roll into a ball, press down onto the prepared tray and repeat for all dough. Bake for 15-20 minutes of until dark golden in colour and firm to the touch. Let cool on tray for 10 minutes and then remove to wire-rack to cool completely. The texture is similar to a banana bread. Soft, but not soggy. I’ll be honest I really, really don’t like soft bread. I spent a long time stuck eating squishy flax bread when I had nothing else and once I had a chance to break away I never looked back. So I’m biased against this bread, but it’s not that bad. It’s soft, but not gooey. It’s a free from kitchen sink job and tweaking it too much would probably trash it. I’ve had better, but something that uses all the flours that usually combine with things I don’t/can’t eat and leaves them to themselves is okay by me. It’s slightly crunchy outside and soft inside. Whether it’s all it’s claimed to be health-wise is hard to say, but with all that’s in it and all that’s left out you could do a lot worse. If you’d rather a firmer loaf with a similar taste try my Pumpkin Spiced Buckwheat Bread. That’s it for me….just kidding, tomorrow, after a three year break, it’s Cheesecake in Buckwheat Pastry time! Makes one small flat loaf. 1. Preheat oven to 180c (No Fan). Grease and line a 6×3 inch loaf pan. 3. In a large bowl mix together, using an electric mixer, the Wet Ingredients. Add Dry Ingredients and mix until combined. Batter will be thick, slightly dry and lumpy. Don’t add Water. 4. Scoop batter into prepared tin, smoothing down with a wet spoon, and bake for 35-45 minutes, turning halfway if needed, until golden brown and a skewer comes out clean. 5. Cool in tin for 5 minutes, then remove from tin, remove greaseproof paper and let cool completely on a wire rack.